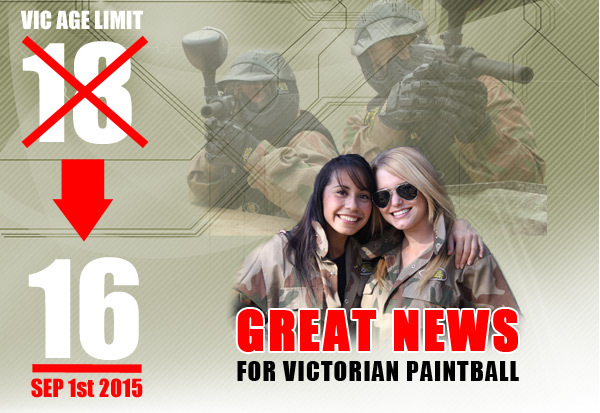 Thanks to years of campaigning from the Delta Force Paintball and the AUPBA the minimum legal age for paintball across Victoria is poised to drop to 16 years old from 1st September 2015. With an official announcement on the age drop expected to be made within the next few weeks Delta Force Paintball has been inundated with provisional booking requests from teenage paintball players who have otherwise been told that they need to be 18 years old to play paintball. A recent change to the Firearms Act will mean that you no longer need to be 18 years old to operate a paintball marker in Victoria. The decision has been well received by paintball operators across Victoria, with Delta Force Paintball already on the search for additional paintball locations across Victoria to cope with the increased demand for paintball. Delta Force Paintball Operations Manager Seamus Fraser said that the paintball scene was set to boom on the back of the age drop, opening the door for teenagers to step up from the modified MiniBall version of the game to play the real thing. “When Delta Force pioneered the launch of MiniBall for kids as young as eight years old in May 2013 the paintball scene received a significant boost in player numbers, however based on the initial interest we’ve received about the upcoming age drop we project an even bigger increase,” Mr Fraser said. Once the age drop has been formally changed on 1st September 2015 Delta Force Paintball will be running dedicated teenage-only school holiday paintball games to celebrate the exciting news.